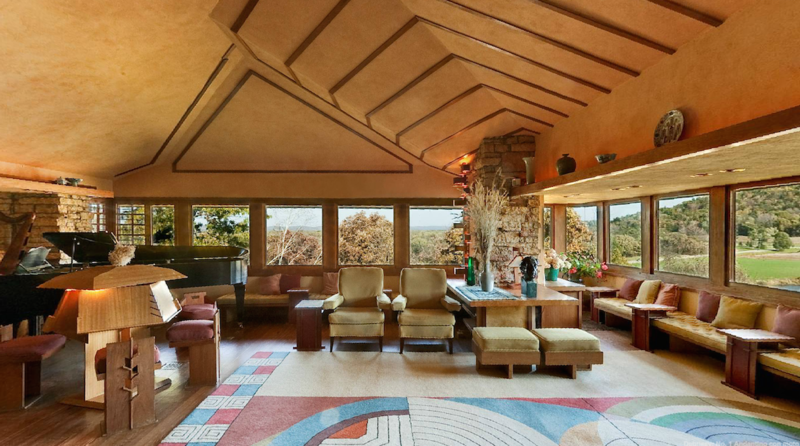 You can learn a lot about an architect from looking at the buildings they designed, and you can learn even more by looking at the buildings they lived in, but you can learn the most of all from Frank Lloyd Wright's Taliesin. For that best-known of all American architects, this house stands still today not just as his home but as one of his notable works, and as the studio in which he designed other notable works (including Fallingwater). Wright's enthusiasts make pilgrimages out to Spring Green, Wisconsin to pay their respects to this singular house on a hill, which offers tours from May through October. For those less inclined toward architectural pilgrimages, we have this HD 360-degree "virtual visit" of Taliesin (also known as Taliesin East since 1937, when Wright built a Taliesin West in Scottsdale, Arizona). "The center of Frank Lloyd Wright’s world was Taliesin East," write the online tour's developers. "It was his home, workshop, architectural laboratory and inspiration for nearly all his life." In the comfort of your web browser, you can "experience what he saw daily, surrounded by Asian art, expansive views of Wisconsin’s rolling hills, his own courtyard gardens and a space to relax before a fire watched over by a portrait of his mother." You can also get a view of "the actual drafting tables where Wright designed his most famous buildings" and the drawings on them, all while "staff historian Keiran Murphy shares the history, the personal stories and points out special objects in the room" (if you choose to keep the "tour guide" option turned on). And Taliesin certainly doesn't lack history, either personal or architectural. Wright built its first iteration in 1911, and it lasted until a paranoid servant burnt it down in 1941, axe-murdering seven people there (including Wright's live-in ladyfriend and her children) in the process. Wright, who'd been away at the time of the tragedy, recovered from the shock of it all, then set to work on Taliesin II, though he didn't really live in it until after he returned from his work on Tokyo's Imperial Hotel in 1922. Three years later, another fire (this time probably due to an electrical problem) badly damaged the house again, necessitating the design of a Taliesin III, which he could begin only after digging himself out of a financial hole in 1928. It is more or less that Taliesin that you can see today, whether you visit in person or through the internet. If you feel sufficiently inspired as a result, you could even apply to study at the Frank Lloyd Wright School of Architecture located there. While the house won't likely turn you into an architectural genius just by osmosis, at least you can rest assured that it has probably put its most dramatic disasters behind it. Thanks for featuring this. It was a very pleasant surprise to see. Glad you and so many others enjoy and hopefully learn something interesting from it. Speaking of learn from it, the tour has been used as a classroom resource at schools and universities around the world allowing them to take a virtual field trip to someplace they otherwise may never have experienced. Kinda cool.